1. Heat the oil in a large frying pan, add the onion and sauté over a medium heat for 4mins. Add the mushrooms and sauté for a further 5mins until the mushrooms are browned. 2. Stir in the chick peas, tomatoes, harissa paste and lemon juice. Bring to the boil, cover and simmer for 8mins. Remove the lid and season to taste. 3. Mix the lemon zest and parsley together. 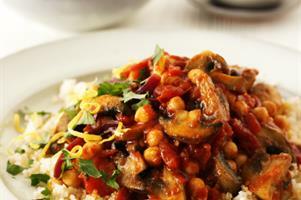 Serve the mushrooms with couscous and a scattering of the lemon and parsley.